I always felt that learning something new, especially new concepts and workflows usually works best if you see it first-hand and get to do things yourself. If you experience directly how your actions influence the system you’re working with, the new connections in your brain form much more quickly. Didier and I talked a while about how to introduce the processes and ideas behind snapd and snapcraft to a new audience, particularly at a workshop or a meet-up and we found we were of the same opinion. Didier put quite a bit of work into solving the infrastructure question. We re-used the work which was put into Codelabs already, so adding a new codelab merely became a question of creating a Google Doc and adding it using a management command. It works nicely, the UI is simple and easy to understand and lets you focus on the content at hand. It was a lot of fun to work on the content and refine the individual steps in a self-teaching workshop style. Thanks a lot everyone for the reviews! From thereon you can quickly start your snap adventure and get up and running in no time. It’s a step-by-step workshop and you always know how much more time you need to complete it. 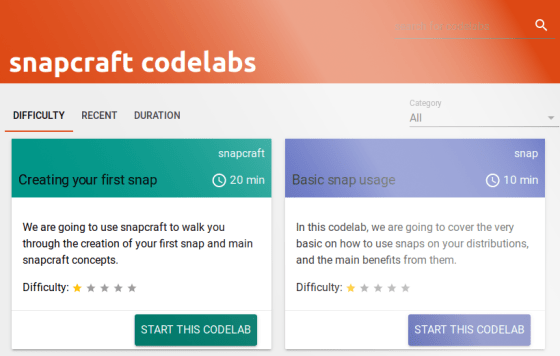 Expect more codelabs to be added soon. If you have feedback, please let us know here. Have fun and when you’re done with your first codelab.